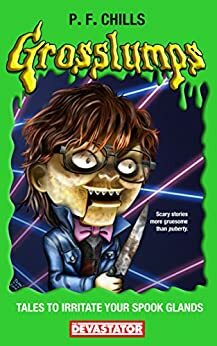 Grosslumps: Tales to Irritate Your Spook Glands - Kindle edition by P. F. Chills, Elan' Trinidad, Geoffrey Golden, Amanda Meadows. Humor & Entertainment Kindle eBooks @ Amazon.com. Here lie nine spooktacular, hauntifying, and ghouleriffic tales by horror mega-maestro P. F. Chills! A high school where human sacrifices are the illest. A magic button that delivers killer pizza. An aging rock band who turns fans into demons. A kid who discovers his parents' divorce lawyers are aliens. These stories and more will give you a nasty, highly contagious case of the grosslumps. P. F. Chills' horror books for children are sold in Dollar World bargain bins across the country! He's written over 900 books. If you stacked them all on top of one another, you would have the premise for Grosslumps #598: The Ghost Librarian's Teetering Stack. If you grew up reading Goosebumps as a kid then you will be snorting out loud with every page at the clever way Grosslumps undermines, homages, and evokes that bygone era of children's horror literature. The parody is DEAD on. A brilliant parody of a classic 90's series. 5.0 out of 5 starsDefinitely Different In A Good Way! I will tell you right away that this is not usually the type of book I review but I am glad that I did review this one. First the cover is just way out there, and definitely created great expatiation of, 'okay what am I going to find inside!' Dare I to open this book and actually read it? Onward I marched. Inside this book we find 11 stories that are sure to raise your hair and keep you glued to the pages. I didn't think that would happen, but it did. I would describe them as 'weird'! My teenage daughter would describe them as "cool!" To be honest with you, the more I read, the more I enjoyed them. I think it is the thought in your mind, 'what is going to happen now,' that brings the entertainment of the read. The wild tales within the pages of this book actually keep you reading with great interest. . I liked 'The Evil Pizza Button the most, and that just can't be good thing. *smile* A really different, fun, off the chart read, and no, you may not hit the pizza button! I received this book for a fair and honest review. I wasn't quite sure what to expect with GROSSLUMPS. What I got was an entire book, including prior book list, copyright page, introduction, afterword AND nine stories, parodying the ever popular Goosebumps children's books. But be forewarned that this book is not for children. It has adult language and situations in it. It is more for those adults reminiscing about the Goosebumps books they read as kids. There are nine stories written by nine different authors under the pen name of P.F. Chills. Funny, macabre, kooky, gross - all the stories are winners. So, if you want a quick read (it's only 120+ pages), read this little gem - and shoot beer out your nose while you're laughing. I LOVE YOUR BOOK Nice And SCARY but I have a idea that kids love books that includes vampires mummies and zombies but overall the book was the best book ever. From Chloe Kyle. 5.0 out of 5 starsHysterically funny! As a lifelong fan of the Goosbumps books, these give R.L. Stine a run for his money. Hilarious from start to finish!